This letter was written by Harmon J. Trask (1843-1912), the son of Israel Trask (1804-1844) and Sophia Mallory (1818-1854). Israel and Sophia emigrated from Ohio to Fulton County, Illinois, from which place they removed to Jefferson township, Louisa County, Iowa, in 1837. 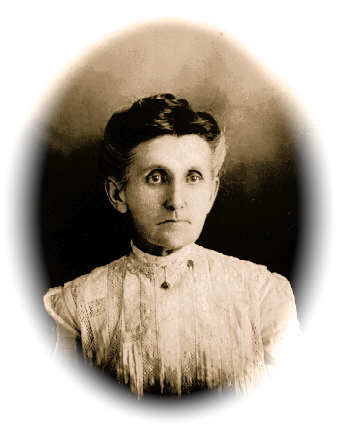 Harmon’s three siblings were Emily Bly Trask (b. 1836), Cornelia Evangeline Trask (1840-1915), and Calista Sophia Trask (1844-1912). Emily married George W. Hook in 1854. Cornelia married Roseberry M. Wilson in 1862. 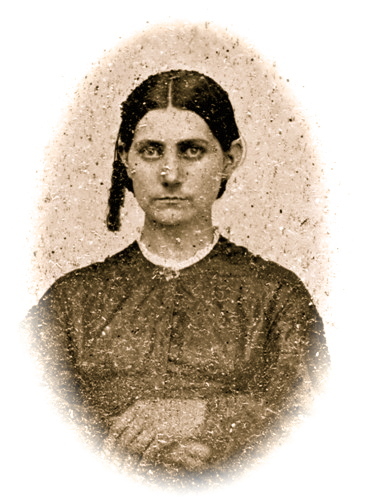 Calista married William H. Prouty in 1867. Harmon was also born at Wapello. 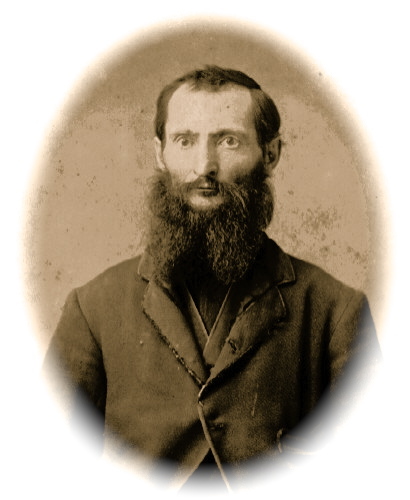 He married Elizabeth Weber on November 2, 1878, in Newton, Kansas. They purchased land in Macon Township, and also in Newton Township. Prior to this, Harmon served five years in Co. K, 8th Iowa Infantry. He was a survivor of the Lewisville, Alabama Confederate Prison, where he was taken after his capture at the Battle of Shiloh. They had one daughter, Elsa, and a son who died as an infant. Elsa was graduated from Bethel Academy, later marrying V. E. Duncanson. They had one son, Lowell, and they lived in San Bernardino, California. I received your letter a few days ago written the 29th of June & was glad to hear that you were all well &c. &c. I am hardy as a buck & Seth Strand [Stevans?] came from the hospital today. He is well &c. &c.
Cornelia, we have fine times a gathering peaches. We have all we can eat or use in any shape or form. I made $4.50 yesterday and today gathering peaches and selling & we have to go about two miles for them. I wrote you a letter while we were at Jackson [Mississippi]. We had fine times chasing old [Joseph E.] Johnston & if he had of stayed there in Jackson two days longer, we would of had his entire army but we got a great many as it was. And yes, I heard about that & I was shocked when I heard of it for last summer when I heard she was going with him, I wrote to her and tried to persuade her to not have anything to do with him & she said that she would not have anything to do with her but it appears as thought thought I knew nothing about him. I will bring this to a close for I want to write a few lines to Calista. You need not send any paper now for I have got my knapsack now and have got a plenty. I have wrote you one letter since I have not heard from you. I wish you was here to help me eat peaches. We have some of the best peaches I have eaten for a long time. Calista, Saturday will be my birthday & shall sister: would like to know whether you are going to school or not. If you are, I will send you some money for we will get our pay shortly. Please go for me. I will pay the bill. I will try to write you a few lines to let you know that I am still a kicking. I received a letter from you yesterday. Am sorry to hear that you was all sick with colds. I can’t see that I was down-hearted any when I wrote you last. This is the Sabbath day & I am on patrol. How I wish you was here. We have very nice weather here the most of the time. Today seems like the break on Spring. We will hardly have anymore cold weather here. Col. [James L.] Geddes has got back. He has been at home for two or three months. We heard that he had resigned but he came back the other night & everyone was looking for him. He says he is going to stay with us till our time is out & they are going to build barracks for our regiment here in town and we will having nothing to do but patrol the town &c.
You said you would like to know who my duck is. She don’t live many miles from Blackhawk but she is now getting better. She has had the typhoid fever. I believe doesn’t care. They think about Netty. I don’t believe he ever thought a great deal of her. I am glad to hear that you can have meeting at Tooleshard ___ more. Hope they may have good success for God knows that the people there have led far astray from the commandments and our father which art in heaven. You say that you don’t know but what you will join the church. If you do ever strive to serve our father in heaven & never be led astray from the path of God for remember, dear sister, that we had a father & mother in that blessed land above and I want to meet them there & I hope you & Cornelia and Emily will strive to serve God. Pray to him. He will answer prayers for he has said so. I will bring my scribbling to a close. Don’t think that I was crying when I wrote this for I was not. Don’t expect you can read this for I always get in such a hurry. Excuse all mistakes from your brother until death.